A Facebook video of a restaurant making Vegan Coney Island Hot Dogs reminded me of a special memory I had with my Grandpa Charlie. My grandpa died very early in my life, so I had completely forgotten that he used to buy me Coney Island Hot Dogs. So after watching that video – I knew I had to make my own. Isn’t that why we love our comfort food so much – bringing back all those happy memories? For those of you NOT from the midwest – a Coney Island is kind of like a Chili Dog. In fact, to many, there will be no difference. BUT…… in Michigan those would be fighting words as Detroit is the birthplace of the original Coney Island. Kind of like arguing if Texas BBQ is better than Kansas City BBQ…..same thing. A Coney Island is an all-beef hot dog, on a steamed bun, topped with a beanless chili, a stripe of mustard, and chopped onions. No less, no more. But no matter what you call them, that video reminded me of not only my time spend with my Grandpa, but also how much I loved Coney Dogs. 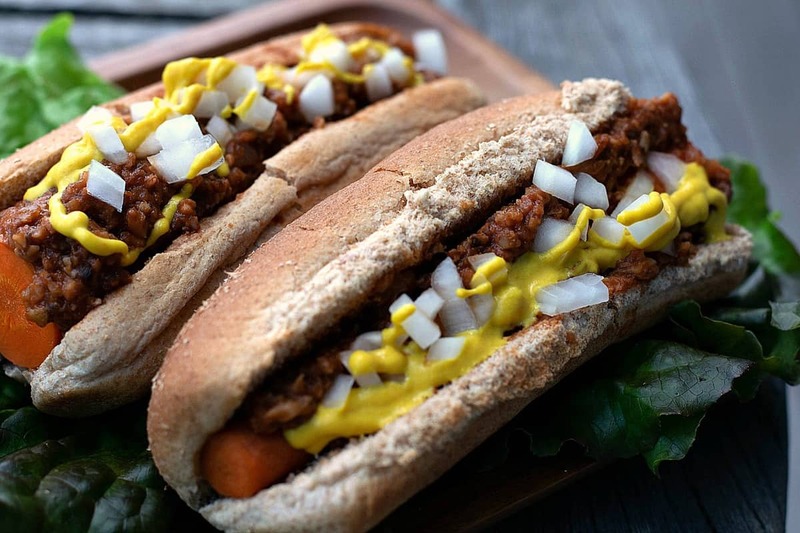 And with a successful Carrot Dog Recipe already under my belt – how hard could it be to replicate Vegan Coney Island Hot Dogs? Typical Coney Sauce is made from hamburger, so I knew I would have to use my Vegan Tacos – Cauliflower Crumble Recipe. After that is was simply a matter of making a thin chili sauce with just enough spice and flavor to match the Coney Sauce I remembered. I’m happy to say the Coney Island Sauce came out incredibly good (like I’m standing over the stove shoveling spoonfuls in my mouth – good). So all that was left was to throw together some of my 5-minute Carrot Dogs and bam – we’d have Coney Dogs. I chopped up some onion, gave them the required stripe of good-old Yellow Mustard and had my first taste…..
Folks – these are amazing! And THAT’S… why I love watching YouTube. At first, it was the Vegan BBQ Video I saw that inspired so many of my own BBQ Recipes this summer. And now Coneys? OMG….yum! Give these a try and if you do, please leave a comment and tell me what you think…. 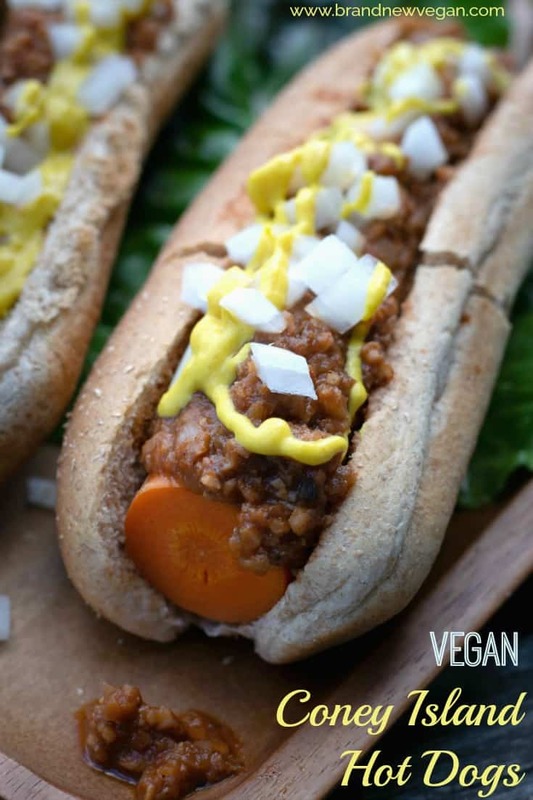 Ok – time to make Vegan Coney Islands! I guess we should begin with a question. Because if you do not – you will want to begin marinating your carrot dogs immediately! In fact, overnight is best, but if you’re in a hurry – at least marinate them for several hours if you can. And if you DO own an Instant Pot – you’re in good shape because it only takes 3-4 minutes and your Carrot Dogs will be ready, so you can continue right along. With the Dog question out of the way – let’s begin making the ‘hamburger meat’ for the Coney Sauce. You will want about 2 cups of finely chopped Cauliflower in a large bowl. You can also use already packaged “riced” cauliflower which will make it even easier. Yes – frozen is ok too. To the cauliflower, add about 1/2 cup of finely diced Mushrooms and 1/4 cup of finely chopped Walnuts. For those of you who have nut allergies – feel free to just omit the walnuts altogether. Stir in 2 tablespoons of Low Sodium Soy Sauce and then spread evenly on a parchment-lined baking sheet. Bake the mixture in a 350 degree F oven (or toaster oven) for 30 minutes – stirring gently halfway through. Meanwhile, finely chop 1 whole yellow onion and start it sweating in a large pan with a splash of Veg Broth to keep it from sticking. Once the onion has softened, add 3 cloves of minced garlic and stir for about 30 seconds or until fragrant. When the cauliflower is finished baking, add that into the pan with the onions and begin adding all the dry spices listed in the recipe below. Stir often to incorporate the spices and gently simmer for a minute or two. Next, add in the tomato paste, the water, and the veg broth. Mix well and then add in the maple syrup, mustard, Worcestershire, and vinegar. Mix well and simmer for 5 minutes on low heat. Finally, we’ll need some dogs – so follow my recipe for Smoky Vegan Carrot Dogs if you have an Instant Pot. Otherwise – you already have then marinating…… right? 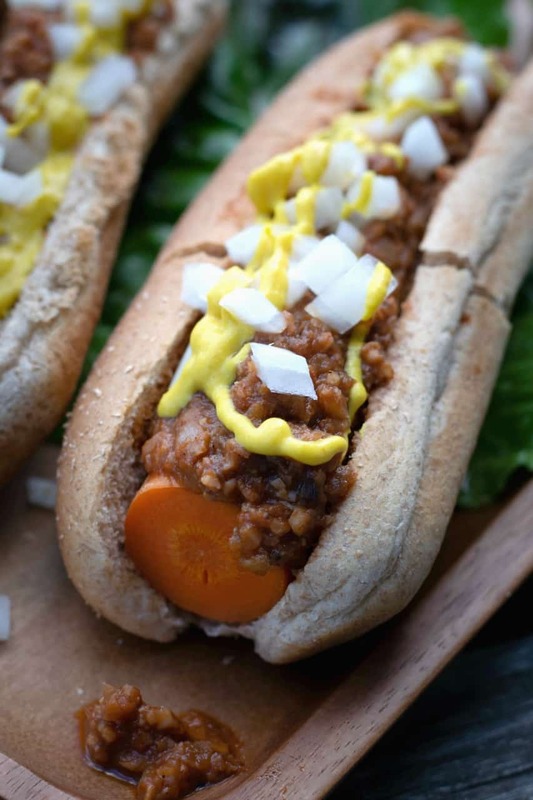 To assemble a “proper” Coney – simply plop down a carrot dog into the bun (bread) of your choice, cover liberally with coney sauce, apply a single stripe of yellow mustard, and add copious amounts of chopped onion. That’s it! 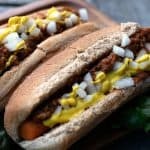 Vegan Coney Island Hot Dogs! Hope you enjoy them as much as I did. And I hope they also bring back happy memories for you as well, like me and my Grandpa Charlie. Until next week —– KEEP ON COOKIN’! If cooking Carrot Dogs on the stove, begin following the Smoky Vegan Carrot Dog Recipe to start them marinating. Otherwise, if you have an Instant Pot, continue on. Chop Cauliflower, mushrooms, and walnuts uniformly, and stir in soy sauce to coat. Spread evenly on a parchment-lined baking sheet and bake in a 350-degree oven for 30 minutes. Pull out half way through and stir. Meanwhile, finely dice the onion and saute in a large pan with a few tablespoons of veg broth to keep from sticking. After onion has softened, stir in minced garlic. Once the cauliflower has finished in the oven, add it to the pan with the onions and stir thoroughly. Add the onion flakes, chili powder, salt, cumin, celery seed, and pepper and stir to mix well. Simmer 5-10 minutes, stirring occasionally, to allow flavors to meld. If it looks too thick, simply add water to thin. If it looks too thin, continue heating to reduce. Finally, prepare Carrot Dogs in Instant Pot per recipe. To assemble – place a Carrot Dog in whatever bread or bun you choose and smother liberally with the coney sauce. Of course, a ‘proper’ coney has a stripe of yellow mustard and freshly chopped onions – but feel free to fix these up any way you want!